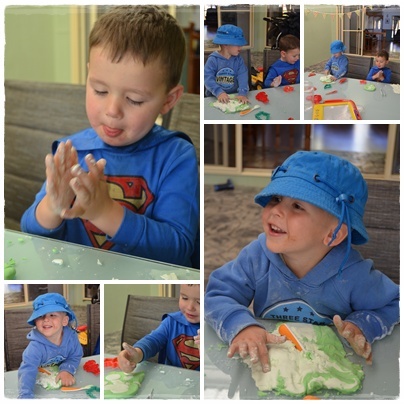 My kids LOVE playdough we make it heaps, the only thing I don;t like it getting it out of the carpet!! Wonder how it would go mixing all the part full bottles of conditioner? I stored it in ziplock bags. It was a bit crumbly the next day so I threw it out. However, a piece stayed out over night and I noticed after the dew had been on it, it was soft again, so if I make it again, I’ll try a spray bottle and squirt some water and knead it in first. Miss Ava has been right into playdough lately, so I’m sure she would love this. What lovely happy photos, playdough of any description is banned in our house since the “trip to the ED because of play dough up nose” incident! Great idea and looks like heaps of fun. I will definitely give it a go!